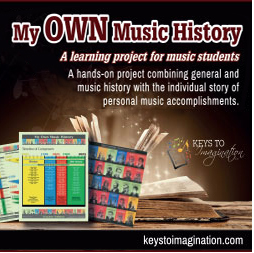 The back page is a Composer Biography page, with a space for placing a postage-stamp-like sticker of 30 composers (included) and blank lines for filling in pertinent biographical and student-related information – i.e., compositions by that composer that the student has learned and performed, etc. 30 postage-stamp-type stickers of famous composers, from J.S. Bach (d. 1750) to A. Khatchaturian (d. 1978). These stickers are to be placed on the Composer Biography page, noted above.